At the beginning of 2016 I wrote about my focus for the year. I’ve posted a few updates throughout the year but want to take some time now to do a final review. I was able to, thanks to a heroic effort in December, meet my goal of writing 50 blog posts. Here is a chart I found interesting. 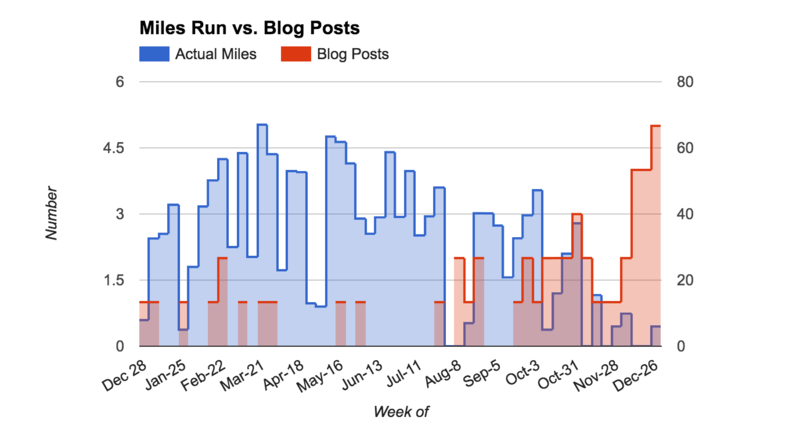 Blog posts per week vs miles run per week. While I got most of my running in during the first half of the year, I did the bulk of my blog posting towards the end. Though I hit the target number, this isn’t an ideal way to do it. Part of my reason for setting goals like this is to set a habit that I view as positive. I believed that if I focused on writing posts for a year, I would get used to the process and continue doing it for years. The best way to do that is likely to have some regularity to it, rather than a huge spike at the end to hit the total number. Because of that rush to the finish, I am somewhat burned out. To avoid that in the future, what I might do is explore setting up cutoff points so the target is evenly dispersed and I can not make up for past misses. If I had broken last year’s goal up to one post per week – I would have hit 29 of 52. Perhaps I would give it some flexibility though by breaking it up by month of quarter – that way I would have some room to absorb busy periods or particularly difficult to write posts. How Are You Liking Seattle? What Makes A Great Rivalry? I wrote three blog posts about health this year – one about why it was important to me, one about how I quantified it and one about steps I was taking to improve an aspect of it. All of those are the culmination of a good bit of thinking on the topic. I would have scored myself higher had I read more on the topic from external authors. I was really synthesizing more than pulling in new information and I think I should be doing more than that for my yearly theme. My fastest marathon this year was 2:42:23, which was ~5.5 minutes short of my goal. So using a binary scale I would have to mark this a failure. I’m ecstatic with the results of this year though. The reason I do these yearly focus challenges is to get myself to focus on something. I believe that by doing less, I can do those things better and achieve results that are exponentially greater than the sum of what I could achieve by splitting my focus. In terms of setting focus, this was a monumental success. At the beginning of the year I had never raced a marathon and it had been close to a decade since I was in good running shape – since I would have called myself a runner. I wasn’t completely sure I could get into this kind of shape again – that I could train like this – that I could avoid injury. I am proud to call myself a runner again. I succeeded in focusing on it this year. I ran three marathons total, Jack & Jill, Big Sur & New York City – finishing in 1st place, 37th place (top 1.5%) and in the top 4% respectively. I ran a 4th of July 10k in my wife’s home town and won that as well. I also locked up KOMs (the fastest time) on a couple of Strava segments in my area. 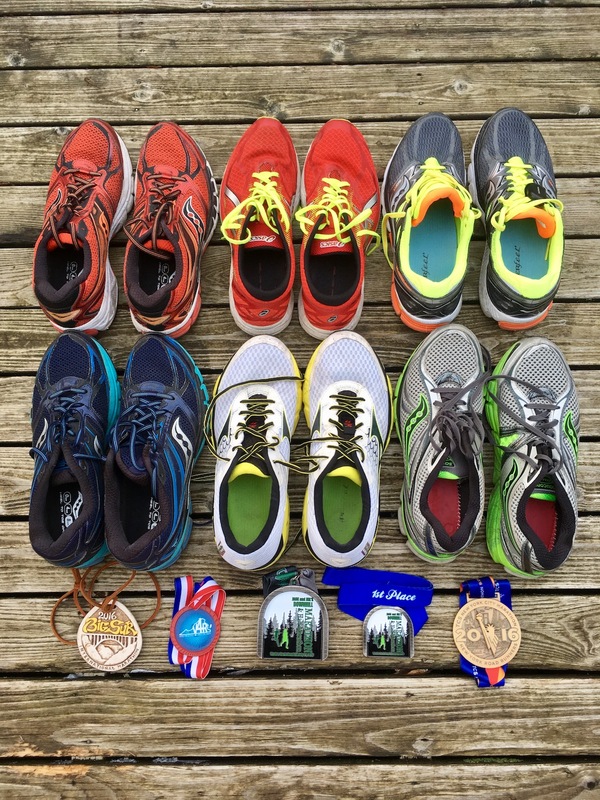 In total I ran 1,627 miles – straight through the midsoles of five pairs of shoes. Here is a picture of all the shoes I wore through the year and the medals I got. Funny that the medal for winning Jack & Jill is smaller than the participant medal. The 4th of July race didn’t have a participant medal, only one for winning my age group. I also had one of my most exciting running incidents when during a late night run I was attacked by an owl. I was actually on the local news as: ‘Greg Kroleski Attacked by Owl While Jogging’. Success. All of this and I would still call my time commitment ‘manageable’. 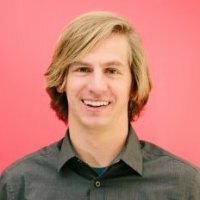 I ran or cross trained on 183 days total, exactly 50% of 365. Across those days I spent a total of 214 hours running. When you add in time for getting dressed, showering, stretching, etc. I would say my average amount of time invested per day was ~1 hour. That seems like the high end of the reasonable range for a yearly challenge. All in all, this was a model year for me in terms of setting focus without overdoing it. I am going to be doing some thinking about how I can repeat this in future years. The original intent of the exemplar category was to learn more about what made that person tick and then implement a few of their practices. My focus was really split across the items this year and so this was the item that got the least attention. I am about 100 pages away from finishing the lengthy Walter Isaacson biography and feel that I have a pretty good sense for who Ben was. The thing I did not get to do much of was implement his practices. If I had more time, that is where I would have spent it.